In Hindu mythology, the Daityas are giant evil spirits who are known for their opposition to sacrifice to the gods. In Hindu mythology, the Daityas are giant evil spirits who are known for their opposition to sacrifice to the gods. They are the offspring of the goddess Diti and Kasyapa. 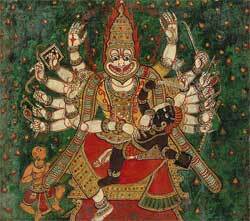 During the first age of the cosmos, the Krita Yuga, the Daityas, led by the dragon-serpent Vritra were so powerful that they took up arms against the gods and defeated them. The gods, who were then scattered throughout the universe, knew that the only way to regain control was to kill Vritra, so they sought out Brahma’s advice. Brahma told them that in order to conquer Vritra, they would have to obtain a demon-slaying weapon from the sage, Rishi. When the gods sought out Rishi, he dedicated his body to their cause and out of his bones, the gods built the weapon Vajra. Indra then led the gods into battle, where they slew the dragon-serpent and defeated the Daityas army. As punishment, Indra sentenced them to a place in the ocean depths called Patala.